Kim Kardashian shows off the unique bouquets of flowers Kanye surprised her with for her 38th birthday - SWANKYLOADED OFFICIAL BLOG. 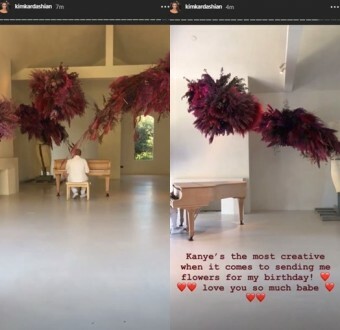 Kim Kardashian-West took to insta-stories minutes ago to show off the bouquets of flowers her husband, Kanye, surprised her with in anticipation of her 38th birthday. The rapper hired a pianist to serenade her in the midst of the flower arangement inside their California home. More photos below.